I’m going to do a Facebook Live on Thursday night, as I do each Thursday during Big 12 league play. During this week’s Facebook Live I’m going to talk about what I consider to be my All-Big 12 Team for the half-season. I’m leaning toward this guy as my Big 12 Player of the Half-Year. 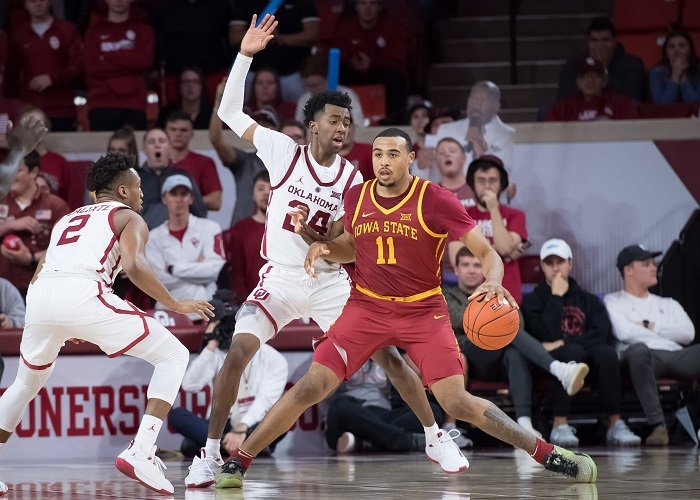 Marial Shayok’s 3-pointer with 1:18 left broke a 69-69 tie with Oklahoma and helped nudge the Iowa State Cyclones to a 75-74 win over the Sooners Monday night in Norman, Okla. It was a win the Sooners (15-8, 3-7 in Big 12) desperately needed but didn’t get. It was a win the Cyclones (18-5, 7-3) can use to hold serve in the Big 12 regular-season race and guarantees they’ll remain in a second-place tie in the league standings. Meanwhile Texas Tech (18-5, 6-4) did really bad things to West Virginia (10-13, 2-8) in Lubbock, Texas, 80-51. So we’re gonna write about the Cyclones and Sooners for a bit. Shayok entered the game second in the Big 12 in scoring with 19.3 points per game. When you consider how this season has gone for the Cyclones, he’s emerged as its most important player. You could argue the injury to Lindell Wigginton allowed Shayok, over the course of the non-conference slate, to assert himself as the team’s No. 1 option. He probably needed that time, too. Shayok didn’t play last season due to transfer rules. Had Wigginton not been injured and been part of the regular lineup from the start, Shayok might not have had the time to assert himself. Plus, Iowa State’s tremendous freshmen, Talen Horton-Tucker and Tyrese Halliburton, might not have had their opportunities to grow either. Wigginton has emerged as perhaps the league’s top Sixth Man as a result. And he has the advantage of, most likely, returning in 2019-20. Shayok does not. He’s a senior and he likely harbors NBA hopes. And the way he’s playing that hope isn’t just aspirational. Shayok ended up with 16 points, including two critical 3-pointers. But Wigginton led the Cyclones with 18 points. It’s a combination that is just difficult to compete with. Then you throw in Horton-Tucker and Halliburton, each of which had 11 points, and picking your poison becomes problematic. Then you throw in the other transfer starter, Michael Jacobson. He had 10 points and 8 rebounds. Plus, now forward Cameron Lard — who has re-emerged as Jacobson’s primary backup after a suspension and slow start to Big 12 season — can do stuff like this. These Cyclones are the league’s leading scoring team for a reason. They’re a defensive nightmare right now. 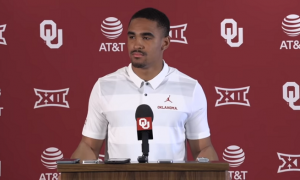 You can’t really zone them because they have enough quality 3-point shooters to make you pay (and one of their best, guard Nick Weiler-Babb, had an off-night and scored just 3 points). Then you have to defend them man-to-man, and, well, between the shooting and having four players that can penetrate and pass well, good luck. And, yet, Oklahoma, sliding and desperate for a win, was in this until the final minute. 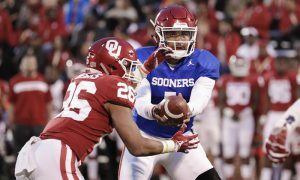 The Sooners did two things that usually leads to wins for them. First, they scored more than 30 points in the first half. This season the Sooners are 14-1 when that happens. Second, forward Brady Manek had four 3-pointers. When that happens the past two seasons the Sooners are 8-1. Note that each stat had an exception. Well Monday night was the second exception. The Sooners started the game shooting the best they’ve shot in more than a week, grabbed the lead early, maintained that for the first half and were up 36-35. To start the second half Iowa State grabbed the lead right away and the two teams just kept trading it back and forth. Forward Kristian Doolittle had a big night with 19 points and 9 rebounds. 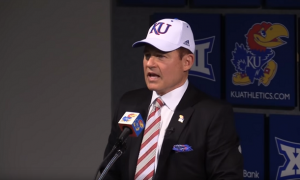 This is the kind of night that head coach Lon Kruger wants every night from Doolittle but just can’t quite get consistently. Manek was nearly as good, dumping in 16 points and netting two blocks. Christian James needed some time to get going, but he finally did in the second half, scoring eight of his 10 points. And, yes, Halliburton was called for a foul there. And, well, there really wasn’t a foul at all when you look at the up-top replay. The Sooners’ desperation got them back into the game in the final minutes, cutting Iowa State’s lead to nothing after a James layup with 1:52 left. That tied the game at 69-69 and it was the only tie in the game. Thirty-four seconds later Shayok did his thing. The Sooners have now lost their last three games and five of their last seven. 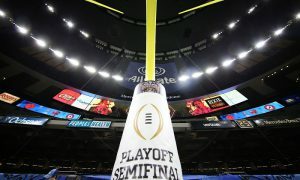 Their next game is against another ranked opponent, Texas Tech, in Lubbock on Saturday. Kruger should be encouraged by how his team played on Monday night. But he needs more consistent scoring options. And he needs this team to shoot closer to 50 percent, too. Iowa State? Right now, don’t change a thing. Just keep winning. The Cyclones have won four straight and they host TCU on Saturday. 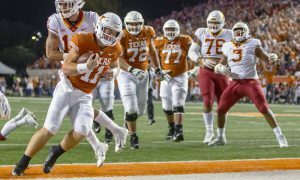 Win that game, and they could end up catching a tired Kansas State team after games against Kansas on Tuesday and Baylor on Saturday. This race could be coming to them. Before we move on, we’d like to interrupt this article for this dunk montage. 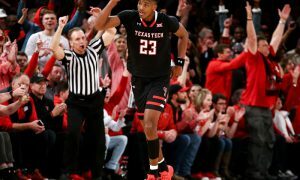 In Lubbock the Red Raiders decimated the short-handed Mountaineers, who have been without forward Sagaba Konate for weeks and were without their guard, James Bolden, once again. In fact West Virginia made just nine field goals in the game, tying North Carolina State for the fewest in any Division I game this season. But all they were talking about after the game was this sideline action during the game. The first time I saw the video I thought to myself, “Dirty.” But they I kept rewinding it and rewinding it. Texas Tech’s Matt Mooney is by the Mountaineers bench and his leg ends up between the legs of West Virginia’s Logan Routt. Mooney plants and tries to move forward and I don’t see Routt’s legs move until Mooney’s leg does. Mooney’s left leg kicks up as he’s trying to run up the floor and Routt’s left leg moves with it. Then Mooney’s leg gets caught between both of Routt’s legs and he falls to the ground. It’s practically impossible for me to determine whether there was any intent. It’s logically possible that Routt meant to do it. It’s also logically possible that Mooney’s leg kick contributed to the trip. After all, Mooney’s left leg began that sequence in between Routt’s legs. Routt ended up being ejected for a flagrant two foul and my guess is the officials probably felt it was the only logical decision they could make. But if you can’t 100 percent determine intent in that situation, is that worth a flagrant two? I don’t know. At the end of the day it’s a talking point and it didn’t determine the outcome of the game. Texas Tech handled the outcome just fine. Brandone Francis had 16 points off the bench to lead Texas Tech. Jarrett Culver had 12 points and Davide Moretti added 11. Deshawn Corprew also had 10 points. 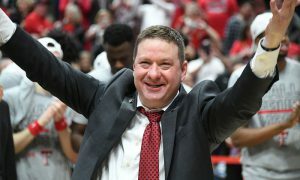 Head coach Chris Beard got to empty his bench, play some walk-ons and wash the stink of that loss to Kansas on Saturday out of his team’s uniforms. The Red Raiders shot better than 50 percent from the floor. West Virginia shot 23 percent from the floor and 18 percent from the 3-point line. The only bright spot was forward Derek Culver, who had 23 points and 12 rebounds. There is clearly a talent dearth on this West Virginia team this year and Bob Huggins and his staff bear some responsibility for that. 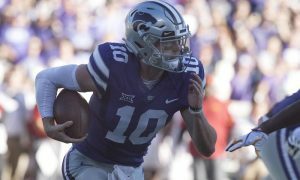 Tuesday night brings us the much-anticipated matchup between Kansas and Kansas State in Manhattan. It’s an 8 p.m. tip at the Octagon of Doom.